3rd through 6th Grade Teachers Stay with me! Prodigy- Practice math facts at home. TweenTribune- Read current even articles at current Lexile level. LearnZillion- Math and ELA videos that can reteach the content to the students. Facegarage- Create Instagram quotes from books or create your own. Tellagami- Create a Talking Avatar about a character in a book. Offline Google Docs- Download the offline app and students can work on their content from home. Then the project will sync once the students return back to school. Post-it Plus- Students can organize their ideas and projects from home with this application that takes a photo of Post-it Notes. Kindergarten through 2nd Grade Teachers Start HERE! First take a moment to relfect back on the different applications that you have used or tired in your classroom since the November 16th meeting. Next Sign into Seesaw.me as a student. Students will join your class the first time you use Seesaw in the classroom. What applications did you use in your classroom in the last month? Give examples of how you used the applications in your classroom. How did the students like the different applications? What applications are you planning on using in the future with your students and how are you going to use that application? Comment on the other post from the teachers in your group. During the mini lesson, we will be covering the following applications. To save on the wifi, please don't download the applications until after the session. You will have access to this website until the end of the school year. Click on the links below to see example and to read about the applications. The below applications are suggested apps that other K-2 teachers are using in the classroom environment. 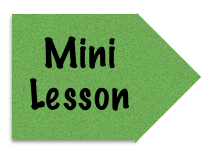 Feel free to explore and use any of the website for your lesson plan. Keep up with the latest technology tools that can be integrated into your classroom and organize the tools that you already use with the program call Edshelf. Feel free to explore some of tools that I have collected for the elementary classrooms through this link. Sign up for an account and start to bookmark some of your favorite tools. 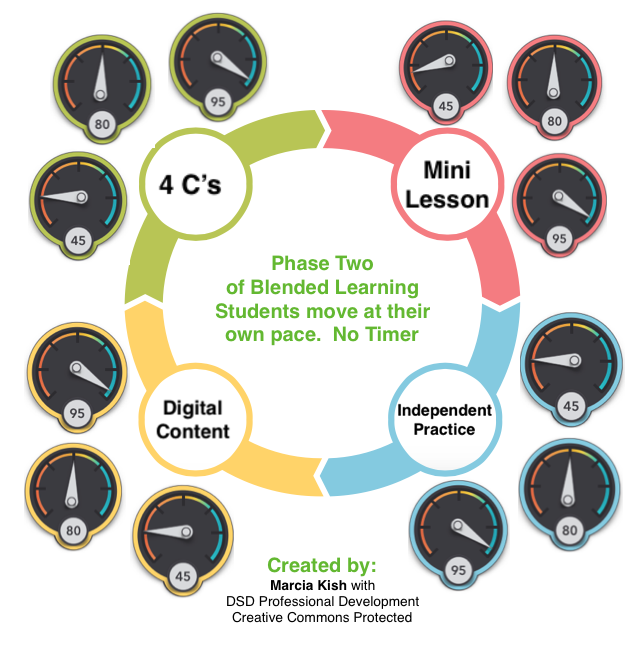 We can learn a lot from other teachers around the country on how they set up their classrooms for a phase 1 blended learning lesson. Examine the posters below and talk with your group on how you can set up the classroom environment to look like a Phase 1. Set goals for what you want to work on between now and the next time we meet. Monthly goal- start looking at the data that is being collected. 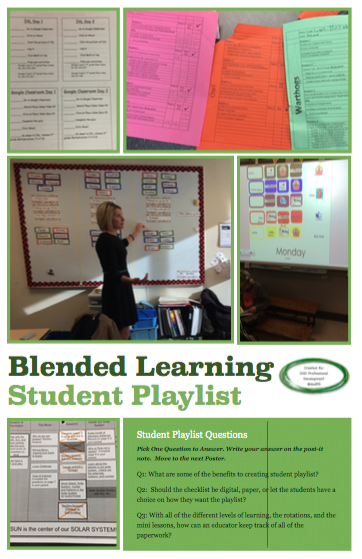 Data folders are a great way to move students and teachers into Phase 2 of blended learning. The teacher not only uses the data to drive instruction but the students start to take ownership in their learning. The following websites provide quality data that adapts to the students needs and ability. Feel free to explore some of the following websites. You can spend time making your own charts and spreadsheets or you can use the remade editable charts found at this website. Spend time exploring and looking at the different data folder forms. Open and manipulate a couple of the forms to meet your classroom needs. Create a checklist of activities or lessons that you would like your students to complete throughout the week. This should not be a daily checklist but rather one that is ongoing and differentiated by ability level. You can use the checklist example that was provided to you today in the Phase 2 packet. Also feel free to look at other examples of checklist below. A Pineapple Chart is a system that allows teachers to invite one another into their classrooms for informal observation. The chart is set up in some location where teachers go on a daily basis: the teacher’s lounge, the copy room, or wherever teacher mailboxes live in your school. On the chart, teachers “advertise” the interesting things they are doing in their classrooms, activities they think others might want to observe. The activities could be as complex as a science lab, a history simulation, or a Skype session with a school in another country. Or they could be as simple as a read-aloud or a lesson on badminton. The chart represents one week of school. Along the top, five columns are labeled Monday through Friday. Along the side, rows assigned to various chunks of each school day. In a middle or high school, these would be class periods. In an elementary school, the rows could be divided by hours or half-hours. 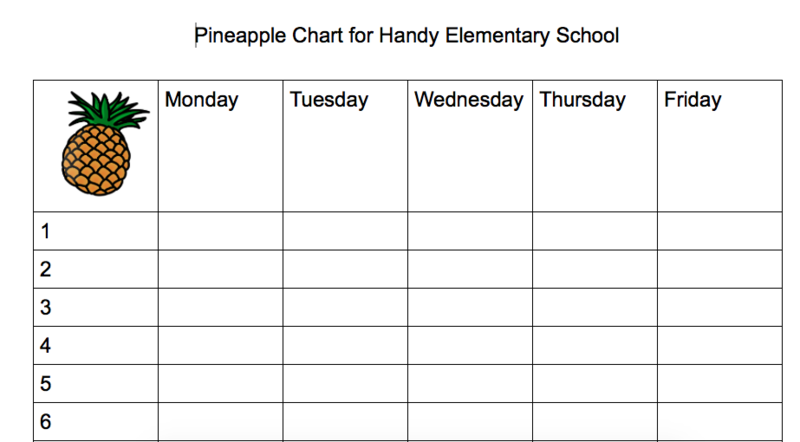 Click here to start creating a Pineapple Chart for Handy Elementary! The DSD Professional Development Team, is excited to be working with the wonderful teachers at across the country that are in the implementation stages of blended learning. This virtual workshop is a stepping stone to generate a starting point for the implementation process of how to deploy blended learning into the classroom setting. Fill out the Google Form after the introduction. If you finish early, take a look at the blended learning technology tools listed below. You will be meeting with the DSD Professional Development team at the front of the room. Make sure you bring your devices. ​Directions will be given once you reach the station. 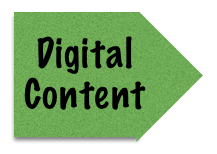 For the Digital content rotation, you are going to explore digital content tools that you can use in your classroom that can provide data for your Phase 2, or Phase 3 blended learning classroom. 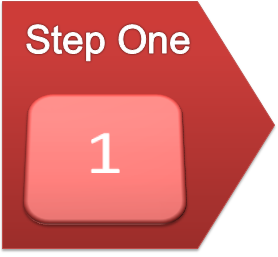 For the Independent rotation, you will be watching videos in regards to Phase 1, Phase 2, and Phase 3. 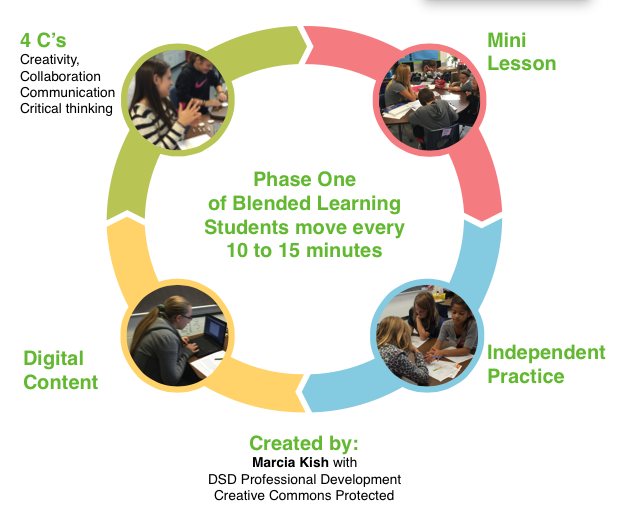 After you are finished watching about the 3 Phases of Blended Learning, you will move onto watching examples of blended learning in action at the elementary level. Why would we want to use them in the classroom? 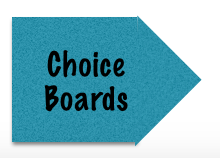 Choice boards are activities that can be used to extend the knowledge of a specific content. The choice boards take learning to the next level. 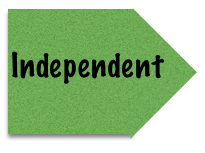 The DSD Professional Development Team implements choice boards into the curriculum because it allows students choice and voice for how they would like to learn the content. 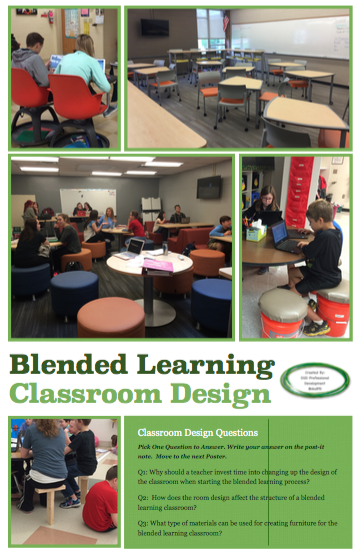 Marcia Kish has been working and teaching about blended learning for the last eight years. After starting the first blended learning high school in Ohio, Marcia is now sharing out the trade secrets on how to deploy the blended learning program in three phases. Jena Cooper has been working as a blended learning coach for the last two years. She loves to showcase how to use technology as well as how good classroom management is the key to a successful blended learning environment.